Google's core advertising business helped to propel a 22 percent increase in sales during the second quarter, even while the cost of its ads dropped. Revenue for the quarter ended June 30 was US$15.96 billion, Google said Thursday, beating the forecast of $15.62 billion, from analysts polled by Thomson Reuters. Net income was $3.42 billion, up nearly 6 percent from $3.23 billion in the second quarter of 2013. The company's earnings per share, excluding certain expenses, was $6.08, a disappointment to analysts expecting $6.24 in earnings. Thursday's results marked the first time Google separated out the money it makes from ads placed on its own sites like Google.com and YouTube, versus the ads on outside sites. The numbers showed the paid clicks on Google's own sites rose by 33 percent, suggesting a strong core business. Paid clicks on outside sites rose by roughly 9 percent. But the cost-per-click dropped by roughly 7 percent on Google's sites. The cost dropped by 13 percent on outside sites. The drop could be due to the lower price of ads on mobile devices. 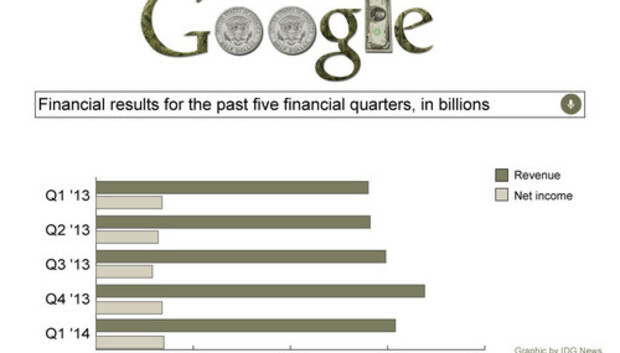 Still, "Google had a great quarter," CFO Patrick Pichette said in a statement. The company also said that Nikesh Arora, Google's chief business officer, will be leaving the company after 10 years with Google. He will be replaced for now by Omid Kordestani, Google's business founder, the company said. Google shares were trading up after hours Thursday at $582.33, after closing at $573.73.